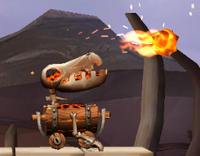 Firehead Neds, also called Hothead Jeds[page number needed], are skeletal dinosaur enemies that appear in Donkey Kong Country Returns and Donkey Kong Country Returns 3D. They are a derived species of Bonehead Jeds that can be found in the Cliff world on Donkey Kong Island. Firehead Neds ride around in Mine Carts with only their heads and necks visible. Both the cart and the creature's skull are filled with red-hot coals, giving their empty eye sockets a orange-red glow. They can extend their neck to shoot out fireballs. If touched by a Kong, the monkey will lose a life. To be defeated, Donkey Kong must jump on Firehead Neds twice, as the first hit temporarily immobilizes them. Any other attack method can be used too, such as throwing a barrel, but Kong Rolls are rendered useless. This page was last edited on September 9, 2018, at 15:25.